The housing market has been a bright spot in the US economy and has led to double digit appreciation in the Denver area. 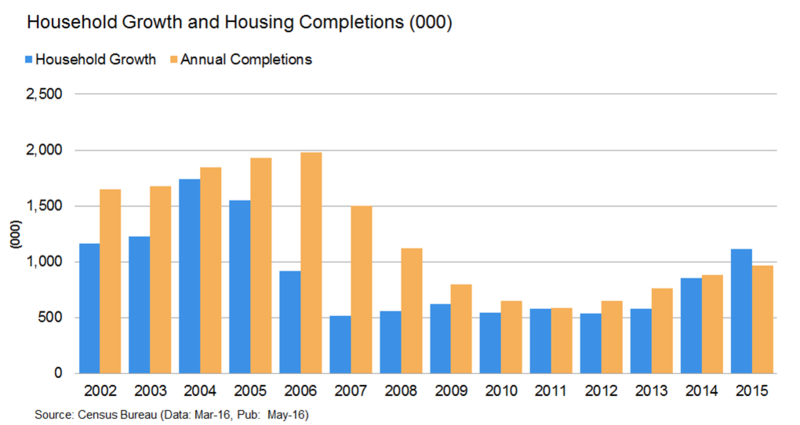 But what could the housing market look like over the next several years? And big picture, what if the economy runs into trouble and the US goes into a recession? Founder & CEO of MBS Highway, Barry Habib weighs in with 3 reasons why the housing market will continue to look strong. We’ve been hearing a bit more about the potential of a recession going forward, but that isn’t necessarily a negative for the housing market. While we saw housing prices decrease significantly during the 2007-08 recession, that drop was more of a correction to an over priced housing market. It wasn’t the normal pattern we see with a recession. 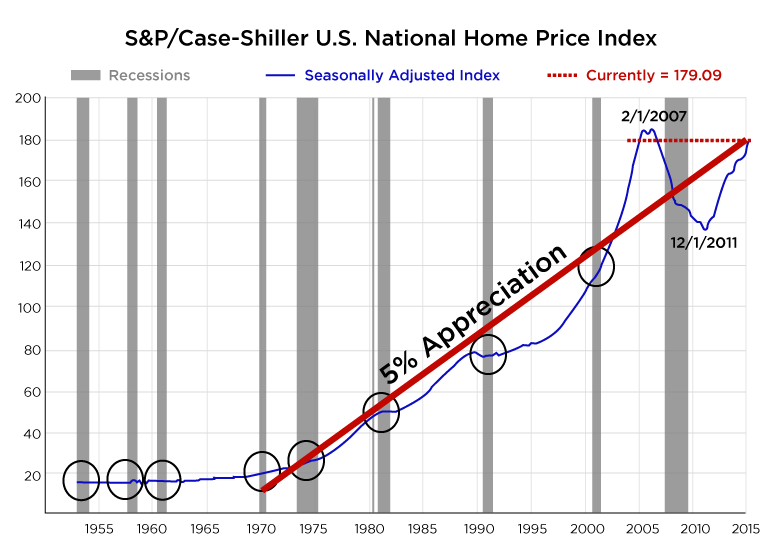 To see why, take a look at the housing price index graph below. The gray bars in the graph represent the 10 recessions we’ve had going back to the 1950’s. The blue line represents the home price index, showing the change in home prices from 1950 through the end of 2015. The circled areas represent how home prices did during each recession period. Home prices actually did well in 9 of the last 10 recessions, not just maintaining values, but also showing some large gains in a handful of recessions. One reason for this is that interest rates typically decline during a recession, leading to an increase in purchases. The graph also shows a 5% appreciation trend line (red) going back to 1975. The housing market traces this trend line pretty well until 2007 where we got a bit ahead of ourselves with an overpriced market and had a big correction. Right now were back on track on the 5% appreciation trend line and look really solid moving forward. The next graph shows Household Formations vs. Household Completions. The blue bars represent household formations and the yellow represents household completions. Household formation is when a new “household” is established that wasn’t there before – either through renting or purchase. For example, when a person moves out of their parent’s house and gets his or her own place, or when a couple that was living together splits up and they both need a new residence, you have new household formations. When comparing home formation to household completion (homes built and put on the market), you can see that 2015 is the first time in over 14 years that there were more formations than home completions. This tells us that there is more demand than supply and is contributing to the low inventory levels we are seeing. Since the 1950’s the “next big step” after high school has changed dramatically. Back then it was common to get married after high school. These days, kids are moving back in with their parents after college (or never leaving after high school). The Pew Research Center reports that for the first time in over 130 years, the most popular living arrangement for adults 18-34 is to live with their parents. A variety of factors contribute to this, including waiting longer to get married and have kids as well as employment and wage status. On a large scale, this trend speaks to pent up demand for housing into the future as the Millennial generation begins to hit that first time home buyer range. The generational changes combined with demand outpacing inventory has the housing market looking at a bright future. Spring is in full bloom and the housing market is heating up. If you’re one of the many Denver area residents who is interested in purchasing a new or existing home, take a look at Denver’s Real Estate Market report card. It’s good news! 69% of households can afford to purchase with only 5% down – the second highest level since 2005. While we have more folks able to purchase, that’s only part of the equation. Let’s take a look at some of the other factors. When looking at Denver’s report card (below), it’s important to know that over time most markets revert back to their average or mean performance, which is a “C.” Another very important indicator to notice is which way the market is trending. A market that is trending higher is a positive indicator. In many cases, a “B” market trending higher may be better than an “A-” market trending lower. What does the current report card mean for Denver? When looking at our 1 year appreciation rate score, you’ll see we’re performing at an A level and trending upwards. This means over the next year it’s likely that home values will continue to appreciate, probably outpacing the national average of 5.54%. That’s great news if you’re selling. If you’re buying that means you’re better off buying sooner rather the later as the home you are looking at today could quickly increase in value. Another factor that can have a significant impact on the strength of the housing market is the health of the job market. Denver’s year-over-year change shows a gain of approximately 56,200 jobs from February of 2014 through February of this year. Patty Silverstein, chief economist for the Metro Denver EDC forecasts job growth in 2015 to be 3 percent, which represents the addition of about 45,000 jobs. Metro Denver’s employment growth in 2014 was 3.2 percent, which was more than 1.3 percentage points higher than the national average. According to Silverstein, natural resources & construction (one of four super sectors of our regional economy) should post 5 percent growth. What trends are you seeing in your neighborhood? Send a quick comment, we’d love to hear from you!